I am SOOOO bummed that I missed out on the arrest!!! I WAS THERE FOR FIVE HOURS AND DID NOT SEE IT??? Bai Ling's good looks and eccentric outfits have frequently put her picture in celebrity magazines, but that doesn't mean she can take the magazines for free. 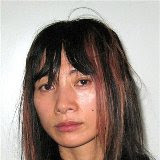 The Chinese actress was arrested Wednesday on suspicion of shoplifting two celebrity magazines and two packets of batteries at Los Angeles International Airport. The items had a total value of $16, said Sgt. Jim Holcomb of the airport's police department. The 41-year-old actress was detained by a store employee who summoned police, Holcomb said. She was booked for investigation of misdemeanor shoplifting and released after agreeing to appear in court on March 5. An e-mail message seeking comment sent to Ling's agent on Thursday was not immediately returned. NOT that I would have known who the heck she was. It just would have been more exciting. Here is what did happen. I went to see if I could get a t-shirt for the Munchkin and Jen did the same for Gabby. We got Mickey tee's. I wandered to the ladies and my gate, chatted up co-workers and tried to get on the earlier flight...NO DICE BABY! And FYI, your flight is delayed one hour already. Returned to Jenn-Goddess' gate to wait until she left for "Rock City" and then shopped more in the scary weird LAX shops. Finally loaded up on the plane and get next to "ISSUE GIRL" She bitched and moaned the whole way about her mother---YES ALL 3 plus hours in turbulence. Then she gets on her cell the SECOND they say you can and calls her mother. We are in the next to last row and I have to listen while we taxi and wait to get off the plane to her saying. "I love you but you have serious issues and I need an apology"
I would have hung up on the ungrateful brat. Thank god my child is two and thinks I hung the moon still.